We recently had a ceremonial burning at our house. In the backyard, one of those fire dishes: into it we dumped Fiske's and Barron's. US News and World Report's Guide to Colleges. Stacks upon stacks of glossy brochures featuring picturesque campuses across the country. Yeah, I guess we could have recycled all that paper, but it felt good ... it felt necessary ... to burn it. Because our last and youngest child, a senior in high school, has been accepted to college and is bound to leave the nest come September. And all of us in our family can now breathe a collective sigh of relief as we leave the oh-so-fraught-and-stressful world of college admissions behind. If a backyard fire isn't in your cards, you might want to check out this book by J.D. Rothman. 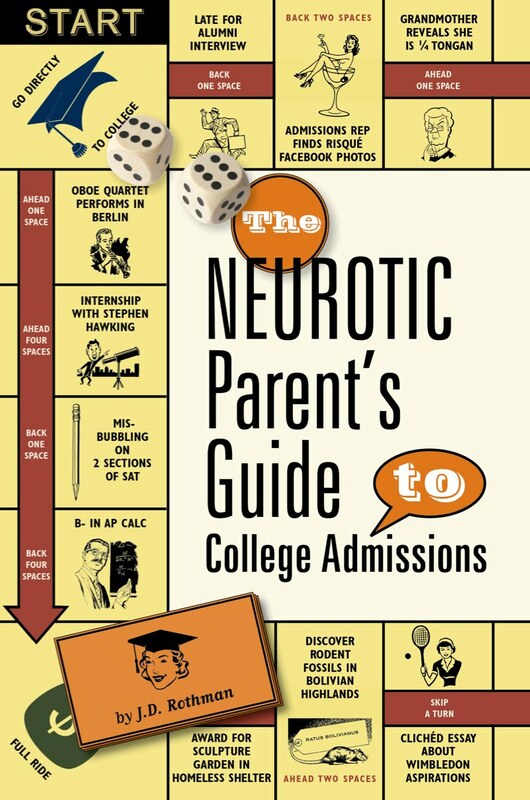 The Neurotic Parent's Guide to College Admissions, and this author's blog, have provided me with a few of the best laughs I've had in a long time. It's a much-needed antidote to the INSANITY which surrounds the current college admissions process ... and Rothman should be applauded for her honesty and self-deprecating sense of humor. The Neurotic Parent started as a blog. Did you plan from the beginning to write a book about your experiences as a helicopter mom? I never thought of myself as a helicopter mom. In fact, I was usually the one who forgot to pick up the entire carpool. And I have still never checked my kids’ homework. But when my son was a junior, I discovered the website CollegeConfidential, where most kids who post have invented an antibiotic by the age of 15. That convinced me that a little hovering was in order, and when one of the soccer moms heard that we had planned an eight-state college tour, she encouraged me to blog. But I never imagined that the blog would become a book…or even that anyone would read it at all. It went viral on the day I posted about the ugly bedspreads at Cornell’s hotel school. How did you find the time, given your demanding day job as an Emmy-award winning writer and lyricist for children’s programs? Blogging is actually a fantastic form of procrastination – once you figure out how to insert hyperlinks, you get to enjoy the process of writing – no deadlines, no page one rewrites, no wacky network executives giving notes. It does cut into my online Scrabble time though. How much of the book is based on real-life experiences? Everything about my obsession with linens for the college dorm is 100% true. Other parts might be somewhat embellished. You’re a Brooklyn native who now lives in Santa Monica. Do you think the process differs from one coast to the other? And in between? Luckily, as far as I know, Kumon for preschoolers does not yet exist here. But we do have plenty of community service. Just about every high school student I know has founded an orphanage in Fiji. Who’s more neurotic: New Yorkers or Angelinos? A recent task force has determined that a city’s level of neurosis is proportionate to a) the percentage of kids who wear hoodies to alumni interviews and b) the cost of the SAT and ACT tutors. New York kids all own a presentable outfit. And top tutors there are $1200 per session, while L.A’s are a mere $990, so that gives New York the edge in neurosis. Both of your sons are in the book (as CJ, Cerebral Jock, and GC, Good Conversationalist). How do they feel about being discussed publicly? CJ is unconcerned about all the anecdotes because like most kids, he doesn’t read, and hasn’t yet gotten through the blog or the book. But GC went to a journalism camp last summer, then poured over the galleys, instructing me to remove all references to him and his friends. For that reason, I focused mostly on the meals during his college tour, rather than his adverse reactions to smug tour guides we met on the trip. What is the single craziest thing you encountered while researching the book? Other than the factoid that George W. Bush had a higher SAT score than Bill Clinton, the most mind-blowing discovery was about the college prep centers in China...prep for American colleges, that is. One company will market, brand and package your child for $15,000. They create fake awards, change kids’ grades and even write their essays, making sure to leave in a few spelling errors so they’ll look authentic. What sanity-preserving advice do you have for parents who have teens going through the admissions process? Love thy safety. Help your kids find a school they’ll be happy to attend that will definitely admit them - even if their essay is about killing cats. You’ve become quite an admissions expert. What are your Top Ten Admissions Tips?! 1. Lots of Mozart and flash cards in utero. 2. Drive over the border to Mexico to give birth. 3. Start your child in an unusual extracurricular, like organic kale farming or atom splitting, before preschool. Don’t even consider piano or T-ball! 4. Move to North Dakota or Montana before middle school (or just rent a trailer) so you can have a zip code from an under-represented state. 5. If your teen doesn’t mind getting up at 5:00am, and likes icy water, consider crew – a favorite sport of college recruiters. 6. If your teen hates a school because of the tour guide’s shoes, don’t force her to apply. 7. When colleges say they like to see an “upward trend” in grades, they’re not talking about going from C’s to B’s. 8. Have several extra T-183s around the house, so you don’t have to go calculator shopping the night before the SAT. 9. Don’t use the word “heretofore” in the essay – a dead giveaway that an adult helped….and please avoid the pronoun “we” throughout the process. 10. Make sure the development office is aware of your great uncle’s foundation. Do you have plans for a follow-up project? Any hints on topics? I doubt if I will find any humor in empty nesting, so instead I’m working on the Broadway musical version of the book. Or if I can make a deal for an edition in Mandarin, I won’t have to work again. J.D. 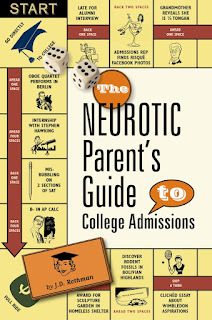 Rothman (The Neurotic Parent's Guide to College Admissions) is the blogger at The Neurotic Parent; her blog posts also appeared in I'm Going to College, Not You (St. Martin's Press). A New York native and Santa Monica resident, she is also an Emmy-winning screenwriter and lyricist specializing in children's literary adaptations. She has successfully guided two sons through the college admissions process, and they're still speaking to her. When I was a 20-something student attending college in Vermont, Robert Frost wasn't just another poet on the syllabus. The "road not taken" guy. JFK's inaugural poet. No, he was a demigod. We made pilgrimmages to his cabin in the woods, lounging about on the grass and taking turns reading aloud to each other. Birches. Mending Wall. Maple. Those were the poems I remember loving and rereading when I was young. Stopping by Woods on a Snowy Evening was also a great favorite, especially when sung to the tune of "Hernando's Hideaway." Thirty years later, I choose different Frost poems. The Draft Horse really spoke to me not long ago, but I've moved past that now, thank goodness. I still love Directive. And I'll confess that when I was 20 I didn't appreciate The Oven Bird; now it's a favorite. So today, in honor of Robert Frost's birthday (March 26, 1874) I'm reading Hyla Brook. And wondering at the miracle that it was my daughter who reminded me that today is the poet's birthday. She'll be heading to that same mountain in Vermont come fall, to discover her own favorite poems. There must be something in the water in my town (Brunswick, Maine) because you can’t throw a stick without hitting a writer. Seriously, there are sooooo many writers in this town! And I’m lucky to know a few of the very coolest … including Kate Egan, who, in addition to being a prolific writer (she’s authored about 50 books for kids) is the editor of The Hunger Games. Yes. Imagine it: Kate worked directly with author Suzanne Collins and was on hand, advising and commenting, as Suzanne revised and improved her drafts of The Hunger Games. Then, when the book was turned into a film, Kate was hired to author The Hunger Games: Official Illustrated Movie Companion and The World of the Hunger Games, which has just made the bestsellers list! Hard to imagine that she’s also a mom in sleepy Brunswick … but being a mom has led to further creative endeavors, because her first picture book, Kate and Nate are Running Late! (a humorous tale about getting ready for school in the morning) is due out soon. You’ve just returned from The Hunger Games premiere! What was that like? The premiere was just amazing. I don't know how else to put it! It was the first time I'd seen Hunger Games fans up close, really seen their dedication to the books and the characters, really felt their excitement. The night before the movie, there were hundreds of kids camped outside the theater, hoping to get the handful of free tickets that would be available for them. They were curled up in sleeping bags, reading battered copies of the books, wearing t-shirts declaring their dedication to Peeta or to Gale. The Hunger Games logo kept coming up on giant video screens around the theater, flaming mockingjays everywhere... it was bigger than anything I'd imagined. It was astonishing to see the throngs of people waiting to see the stars next day. Just like in the movies! After seeing the film, I know that I will always picture Jennifer Lawrence as Katniss now. She's that good. How did you feel the filmmakers did creating Panem? 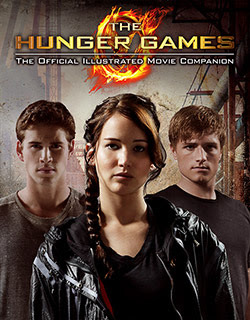 Because I wrote the Official Illustrated Movie Companion (a New York Times bestseller!) I'd had an advance peek at many of the scenes. But seeing still photographs was very different from seeing it all come to life on screen. I was really moved by the way District 12 is portrayed in the movie. It is desperately poor, but it's Katniss's home, and it is wrenching to see her leave it. The Capitol scenes are dazzling and weird, which I mean in the best way. Every detail shows that the place is twisted and baffling. Like Katniss, you don't want to spend too much time there. What’s it like to work with Suzanne Collins? I'd say that my job is to ask Suzanne questions, to probe for details that might be in her head but haven't yet made it onto the page. She is a phenomenal writer, and sometimes she pushes back on editorial suggestions, and I trust her judgment. I have learned an enormous amount about writing from her. And Suzanne and I worked very closely with Scholastic's David Levithan on the books. He is a phenomenal writer and editor himself. Tell us about your new picture book. 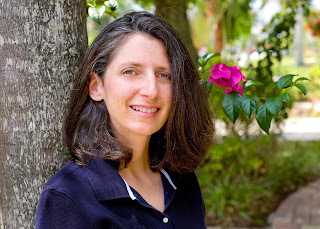 Kate Egan has worked in publishing for almost twenty years, both as an editor and a writer. The first book she edited was 99 1/2 Animal Jokes, Riddles and Nonsense (which still makes her laugh), and the first book she wrote was Pony Party (featuring My Little Pony dolls at a celebration). 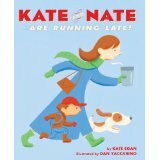 More recently, she has edited the novels in the Hunger Games trilogy, and her first picture book, Kate and Nate Are Running Late!, will be published this fall by Feiwel and Friends. Kate lives in Brunswick, Maine, with her husband, two kids, and two cats. Poems surprise me with unexpected details. A few carefully chosen words can evoke an entire scene in my imagination. 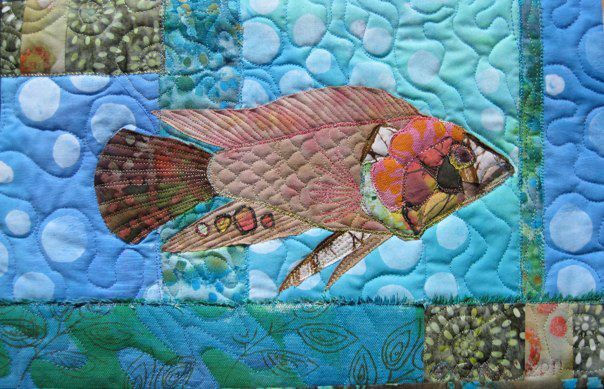 "The Catfish" by Matthew Beacom does this so beautifully. The Connecticut Review awarded "The Catfish" the Leo Connellan Prize, and published it in their Spring 2010 issue. across the Missouri at Gavin’s Point. second hand, from Braunger’s Meats. We drove along the top of the dam. above low, grassy hills dried brown. a lake that drowned 30,000 acres. I’d never seen so much water before. at me—its whiskers as long as my arm. like a camera’s aperture shutting. I fell—like Jonah swallowed by the whale. Matthew Beacom was born and raised in Sioux City, Iowa, and has lived in Connecticut with his wife and children for over 20 years. He is a part-time student in the creative writing MFA program at Southern Connecticut State University and is employed as the Head of Technical Services at the Beinecke Rare Book and Manuscript Library at Yale University. I first met author Donna Gephart at a Random House "It's a First" reception in Philadelphia. Both of us had debut novels coming out that spring, and our publisher had hosted a lovely party during the ALA convention to introduce several of us new authors to each other, agents, staff, etc. It was definitely an opportunity for pretention: but Donna is one of those refreshingly real, down-to-earth women you like right off the bat. Her novels reflect her genuine kindness and humor, and based on their runaway success, it's pretty clear that kids love them! 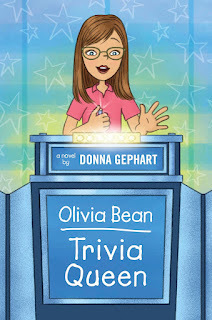 OLIVIA BEAN, TRIVIA QUEEN is her latest middle grade novel, and just launched this week. Her other books include AS IF BEING 12-3/4 ISN'T BAD ENOUGH, MY MOTHER IS RUNNING FOR PRESIDENT!, which won the Sid Fleischman Humor Award and a Florida State Book Award, and HOW TO SURVIVE MIDDLE SCHOOL, which received starred reviews from both Kirkus and School Library Journal. 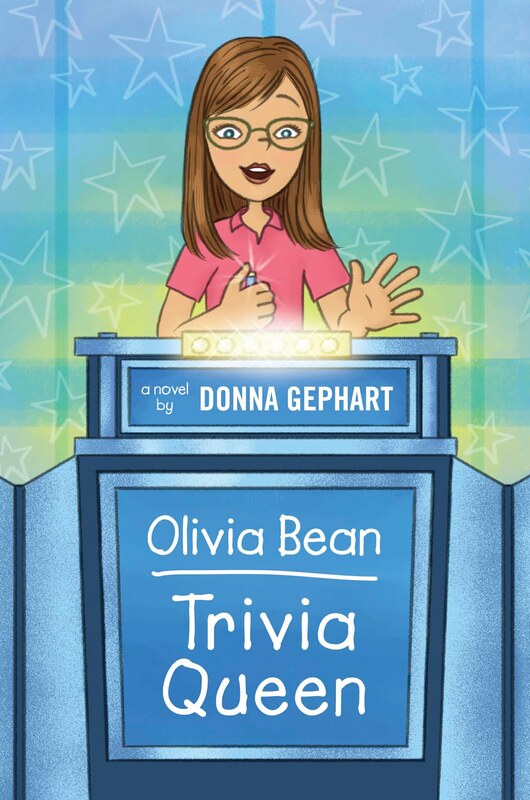 How did the idea for OLIVIA BEAN, TRIVIA QUEEN come about, and are you by any chance a JEOPARDY! fan? My dad, 84, is a huge Jeopardy! fan. It's so much fun to watch the show with him because he yells the answers at the TV. I wrote Olivia Bean, Trivia Queen as part of the National Novel Writing Month initiative, and finished the book in 29 days. It took months, however, to revise it. The title came to me and the rest flowed from there. Your middle grade books are laugh-out-loud funny. Did you intentionally pursue writing humor for children, or did it just ... happen? Thank you. That's just naturally how I write, how I talk, etc. Life has so many bumps, I figure we should get in all the laughs we can when we can. I am working on a new funny middle grade novel that I'm super excited about, but I can't share details this early in the process. Again, it began with the title and mushroomed from there. I love when that happens! I'll confess, I'm so impressed that Ken Jennings of JEOPARDY! fame "blurbed" the back of your book! How did that happen and, more importantly, have you met him? I sent him a copy of my book, autographed to him. The character in my book is a huge fan of his (page 123). Ken Jennings has been so generous to not only blurb my book, but to endorse it on his blog. I haven't met him . . . yet. But when I do, he can expect a great big THANK YOU from me (and Olivia)! I love poetry. Love love love it. Volumes of poems teeter dangerously on my bedside table. I purchase mini-books of poems to carry in my shoulder bag so I'll have a few to read whenever I'm waiting on line somewhere. Old poems, contemp poems, laugh-out-loud poems and devastatingly dark poems (think: Robert Frost's "The Draft Horse." Yeah, even that one.) I can't get enough. So I guess it's one of the tragedies of my writing life that I'm an AWFUL poet. Really, no false modesty here: my poems are abysmal. Unless you count limericks (which I don't, even though I can spin out any number of limericks on demand; a strange but useless gift) I am poetically-challenged. Combine my enthusiasm with my lack of talent and you have: Poems for a Monday. Something new I plan for my blog. Every Monday (hopefully every Monday) I'll post a poem here with a little something about the extremely talented person who wrote it. 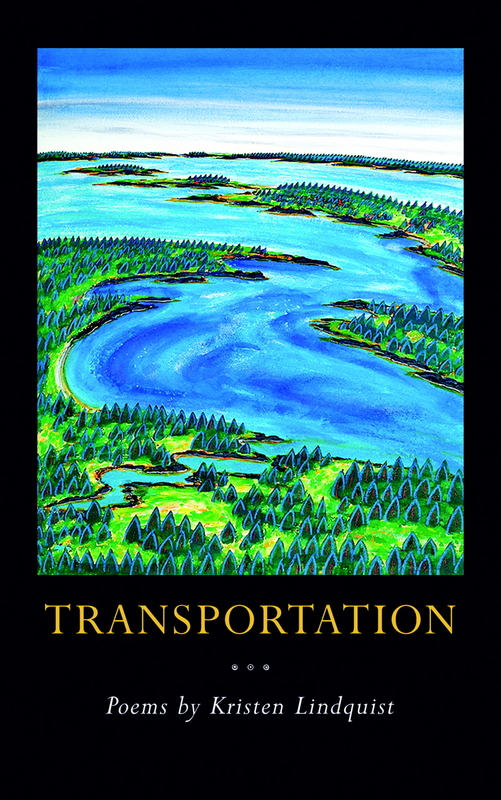 So here it is, the inaugural Poem for a Monday: Kristen Lindquist's "Transportation," from her collection of the same title, published by Megunticook Press, cover art by Eric Hopkins. Everyone in O'Hare is happy today. and racks of Bulls t-shirts. My plane was twenty minutes early. I am ecstatic. I can't stop smiling. and Middle America green and gold below. thanked him, with sudden and wholehearted sincerity. and I want to ask where they're going. Tell me your story, I want to say. This is life in motion. How can I bring this new self back to you, intact? "Hey, I like the way you move!" Any kind of love seems possible. We walk through this light together. So what if it's an airport? So what if it won't last? Kristen Lindquist lives with her husband Paul in her hometown of Camden, Maine, where she works as development director for Coastal Mountains Land Trust. She received her MFA from the University of Oregon. Her poetry and other writings have appeared in Down East Magazine, the Maine Times, and the Bangor Daily News, as well as various literary journals and anthologies. Her chapbook Invocation to the Birds was published in 2001 by Oyster River Press. 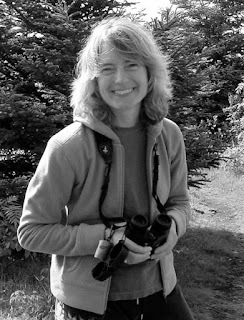 An avid birder, she writes a monthly natural history column for the Herald Gazette.